[178 Pages Report] The top 10 cellular analysis market is expected to reach USD 41.34 Billion by 2021 from USD 28.66 Billion in 2016, at a CAGR of 7.6% from 2016 to 2021. In this report, the market is classified on the basis of technology, application, end user, and region. On the basis of technology, the market is segmented into sample preparation technologies, cell imaging techniques, spectrophotometry, flow cytometry, polymerase chain reaction (PCR), blotting, high-content screening, centrifugation, cell counting, and cell microarray technology. On the basis of application, the market is segmented into stem cell research, biopharmaceutical applications, cancer research, tissue engineering and regenerative medicine, and others applications (genetic counselling, cultures, virology, in vitro diagnostics, and IVF). Based on end user, the top 10 cellular analysis market is segmented into research laboratories & institutes, cell banks, hospitals & diagnostic laboratories, biotechnology & pharmaceutical companies, and other end users (environmental monitoring organizations, food & beverage manufacturers, blood banks, and forensic laboratories). Based on region, the market is segmented into North America, Europe, Asia, and the Rest of the World (RoW). The major players in the top 10 cellular analysis market are Thermo Fisher Scientific Inc. (U.S.), Bio-Rad Laboratories (U.S.), Agilent Technologies (U.S.), Becton, Dickinson and Company (U.S.), Beckman Coulter, Inc. (U.S.), Merck KGaA (Germany), Olympus Corporation (Japan), GE Healthcare (U.S.), Tecan Group (Switzerland), and Nikon Instruments (Japan). This report aims to provide insights into the top 10 cellular analysis market. It provides valuable information on technology, application, end user, and region of the market. Leading players in the market are profiled to study their product offerings and understand the strategies undertaken by them to be competitive in this market. The abovementioned information would benefit the buyer by helping them understand the market dynamics. In addition, the forecasts provided in the report will enable firms to understand the trends in this market and better position themselves to capitalize the growth opportunities. The top 10 cellular analysis market is expected to reach USD 41.34 Billion by 2021 from USD 28.66 Billion in 2016, at a CAGR of 7.6% during the forecast period. Cellular analysis is used for cell identification, cell interaction, cell viability, cell proliferation, cell structure study, cell signaling/cell transduction, target identification & validation, cell counting, and quality control. Currently, cellular analysis technologies are used in various phases of the drug discovery process, cancer diagnosis (oncology), blood cell analysis, toxicity testing, personalized medicine, pathogen testing, and other applications. In addition, cellular analysis technologies are extensively used in research institutes for understanding the evolution and development process of various types of cells. Growth in the market is primarily driven by the availability of corporate and government funding for cell-based research and rising incidence of chronic and infectious diseases. The introduction of technologically advanced products for cell analysis, growing life sciences industry, and increase in healthcare spending are the other factors supporting the growth of this market. However, high installation and implementation costs of cell analysis systems and stringent regulations for their approval are expected to hinder the growth of this market. Based on technology, the top 10 cellular analysis market is segmented into cell imaging techniques, flow cytometry, spectrophotometry, polymerase chain reaction (PCR), cell counting, blotting, high-content screening, sample preparation technologies, cell microarray technology, and centrifugation. The cell imaging techniques segment dominates the market in 2016. Factors expected to drive the cell imaging techniques market are rising investments in life sciences research and introduction of technologically advanced cell imaging instruments for cell analysis procedures. On the basis of application, the market is segmented into biopharmaceutical applications, cancer research, stem cell research, tissue engineering and regenerative medicine, and other applications (organ cultures, IVF, virology, in vitro diagnostics, and genetic counselling). In 2016, the biopharmaceutical applications segment is expected to account for the largest share of the market. The large share of this segment can be attributed to the increasing investments by companies for the production of biopharmaceutical products. On the basis of end user, the market is segmented into hospitals and diagnostic laboratories, research laboratories and institutes, cell banks, biotechnology and pharmaceutical companies, and other end users (food and beverage manufacturers, environmental monitoring organizations, forensic laboratories, and blood banks). The hospitals and diagnostic laboratories segment is expected to account for the largest share of the top 10 cellular analysis market in 2016. Some of the major factors driving the growth of this segment include increasing incidence of chronic and infectious diseases and increasing investments in healthcare systems across the globe. 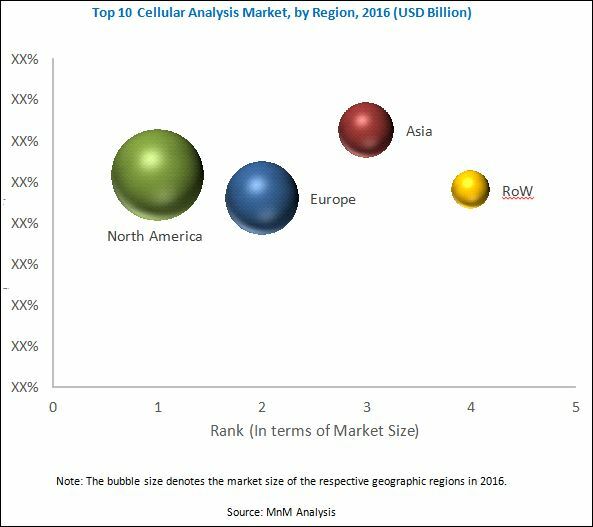 In 2016, the top 10 cellular analysis market is dominated by North America, followed by Europe, Asia, and the RoW. North America is expected to continue to dominate the market in 2021. Asia is projected to witness the highest CAGR, with the growth in this market centered at China, Japan, and India. The major players in the top 10 cellular analysis market include Thermo Fisher Scientific Inc. (U.S.), Agilent Technologies (U.S.), Becton, Dickinson and Company (U.S.), Bio-Rad Laboratories (U.S.), Beckman Coulter Inc. (U.S.), Merck KGaA (Germany), GE Healthcare (U.S.), Olympus Corporation (Japan), Tecan Group (Switzerland), and Nikon Instruments (Japan).